Michael Fan was a founding member of the TSO Piano Trio. 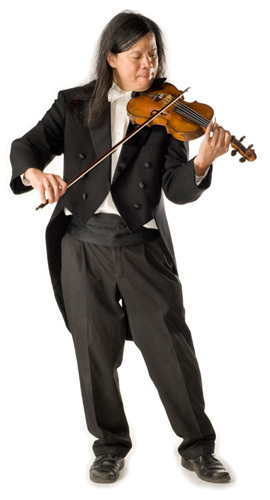 Prior to that he played violin in the Tucson Symphony String Quartet. For theTSO Just for Kid’s series, Mr. Fan wrote and composed The Brementown Musicians, The Little Fiddle, The Ugly Duckling, Goldilocks and the Three Bears, The Magical Musical Story Machine, The Princess and the Frog, Happy Birthday, Wolfgang!, Beethoven’s Mouse, Case of the Missing Music, Mak and Millie, Follow Me and Cat with a Fiddle. He was commissioned by TSO Flute, Viola, Harp Trio to compose four pieces for the TSO Just for Kids series, Sam and the Crazy Daisy, Emily and the Ghost Flute, Mel and Mama Cholla, and Pip and the Pirate. Additional children’s compositions include Kalimba-kee and A Different Song which were commissioned by the Brass Quintet Heavy Metal. Kalimba-kee was performed by the TSO Brass Quintet for Just for Kids in 2009. In October, 2009, A Bright New Day, or Dr. Solara and the Fossil Fools was performed on the Mall in Washington D.C. by a solar-powered Trio to accompany the University of Arizona’s entry in the Solar House Decathalon. In 2013, The Solar Storytellers, Michael’s, electric, solar-powered piano trio were invited to perform his composition Phoebe, the Photon at the Aspen Science Festival. Guilty musical secret: I don’t feel really guilty about this, but not many people know about it. I played a violin solo on a rock album – my one and only rock solo. It was on the song “Gunny black” on the album “El Paso” by Rich Hopkins and Los Luminarios. Most embarrassing musical moment: I was playing at a party with one of my bands, The Street Minstrels, and they requested that we play “Happy Birthday.” For some strange reason, I don’t know why, I started to play Wagner’s “Bridal Chorus” instead. I managed to correct myself after only a few notes, but that was really embarrassing. Most exciting musical experience: Playing jazz in public for the first time with my brother-in-law, clarinetist john Denman, at Gus & Andy’s. What would your career be if you hadn’t chosen music? Favorite composers: I like composers that have interesting chords and lots of color in their music; Ravel, Stravinsky, Mahler, Prokofiev and Poulenc are just a few of my favorites. Hometown: I’ve lived in Tucson since I was 10.